Naturally, this includes creating more comfortable, energy efficient homes through our primary services, but also giving back to our community through our WESCare program. About a year ago, we got a phone call from RallyPoint/6. They were an organization starting up in Lakewood with a mission to be the largest one-stop resource center for transitioning service members, National Guard and reservists, veterans and military families in Washington State. At that time, RallyPoint/6 had a problem that we could solve, so we stepped in. 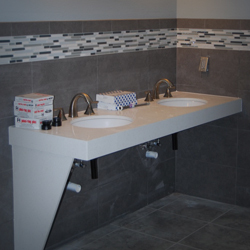 They needed bathrooms plumbed for their new facility and with our commitment to donate our plumbing services to help disabled veterans, this was right up our alley. Our journeyman plumbers volunteered and got the sinks and toilets there piped in, installed and running. See the project. Ever since then, we have enjoyed a great relationship with RallyPoint/6, and appreciate them bringing us opportunities where we can provide our plumbing services to deserving veterans. One recipient was Harold Roberts. The 92-year-old Purple Heart veteran of WWII and his wife were living in a house that had no hot water for six months. That’s way too long to be boiling water on the stove. We were glad that RallyPoint/6 found out and gave us a call. 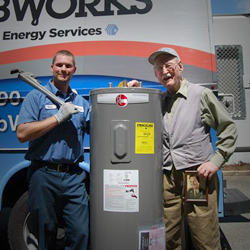 We gave him a new water heater and fixed his plumbing. We were proud to put a smile on his face. We are passionate about supporting our troops and thanking those who have served. As an extension to our community volunteer work to support veterans, Washington Energy is also actively seeking to hire veterans for various positions including installers and service technicians. More information on employment opportunities can be found on the Washington Energy website. At Washington Energy, we look forward to our continued support of RallyPoint/6 and our country’s veterans.